To help me answer the question why hire a virtual assistant? in a way that you can relate to, I’ve had a chat with one of my clients about her own experiences. 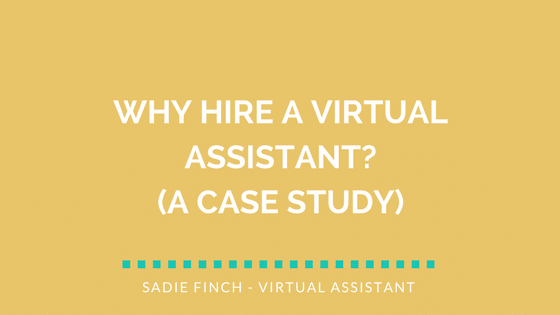 If you’re thinking about outsourcing to a Virtual Assistant (VA) yourself but you’re not quite sure how or why you should, I hope this case study will answer some of your questions. Rachael Savage is a Chartered Accountant and the owner of Simplified Accounting Ltd, a company that provides high-quality and affordable accounting support and business advice to small and medium owner-managed businesses. When Rachael found her business growing significantly, her family life began to suffer. No longer maintaining the work-life balance she’d once been used to, she needed a solution – and fast. There was no immediate way Rachael could reduce the amount of work involved in running her business. (Without missing out on opportunities and losing work, that is). It was obvious to her that she needed an extra pair of hands, but hiring an employee didn’t feel like the right move. Rachael knew that a Virtual Assistant could provide her with the right level of support in a flexible and less restrictive way. It was important to Rachael that she find a VA she could trust. After asking around for recommendations, my name came up. Shortly after first being introduced, we hit the ground running. Rachael said she felt confident from the start that I understand her needs, so it was just a case figuring out how we would work together. Rachael then went through her list, marking off the things she didn’t enjoy doing and the things that could potentially be handled by someone else. This is a great method for helping you figure out what to delegate and it’s how I recommend you get started yourself if you’re considering hiring a VA. It became clear to Rachael that admin wasn’t her area, which made me a great fit. Some VAs have specialist areas, like finance or marketing, for example. For me, it’s admin. I love organising and looking for ways to increase productivity. That may mean implementing new processes or finding software that can make life easier for business owners. Rachael and I started off working together on a pay as you go basis. At the beginning, we weren’t sure how many hours of support Rachael would need, but after a couple of months, we developed a routine and Rachael moved to a retainer contract. This means she now gets my support for a guaranteed number of hours per month. It’s also the most cost-effective option. There’s one thing that’s made a massive difference to the way Rachael runs her business. It’s the improvements I’ve made to her systems and processes. When you hire a good Virtual Assistant, you’ll get so much more than just an extra pair of hands; you’ll get an extra head, too. For me, it’s about so much more than just taking away the tasks you don’t have time for. I’ll work with you to develop smarter ways of running your business. My overall goal is to help you feel more organised, efficient and in control. To have an informal chat with me about how I might support you and your business, email me at sadie@sadiefinch.com to arrange a free 1-hour consultation.